In this chapter, you’ll learn how to add and configure WebDriver endpoints. Set up a WebDriver infrastructure, start the server, and note its address. Ranorex Studio supports Selenium and Appium through WebDriver endpoints. Setting up a Selenium infrastructure is covered in ⇢ Selenium WebDriver integration. On Appium, Ranorex Studio currently supports only mobile web tests. For help with setting up an Appium infrastructure, please refer to the official Appium documentation. Also, make sure you set the command timeout to at least 30 seconds in the ⇢ plugin settings for WebDriver. Endpoint list with Localhost (the computer) and two additional endpoints. 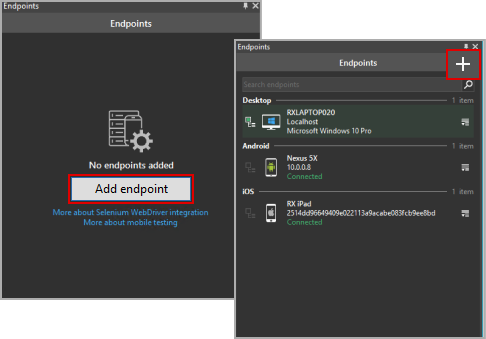 In an empty endpoint list, click Add endpoint. Or, in list that is not empty, click +. Enter a name for this endpoint. In a default Selenium environment you must add /wd/hub to the URL or IP address of your Selenium server. Only change or omit this path if you have set up your Selenium infrastructure differently. Click Test connection to see if a connection can be established. If the test fails, check that your server address is correct and that the server is running. Click Add endpoint and Complete setup. The new WebDriver endpoint appears in the endpoint list. Endpoint configurations allow you to tell a Selenium WebDriver endpoint how to behave during test execution. Selenium calls these characteristics of an endpoint capabilities. Most commonly, they define what OS, browser, and browser version the WebDriver endpoint simulates. In Ranorex, the sum of all capabilities defined for an endpoint is called an endpoint configuration. Endpoint configurations make it possible to easily execute tests in a Selenium grid on multiple different system configurations without actually needing to have any of these systems present. Click the symbol to the right of a Selenium WebDriver endpoint. Endpoint information showing name, connection status, and server address. List of currently running browsers with browser name and URL. Enter the configuration, i.e. the capabilities definition, as JSON. Make sure it conforms to the requirements of your Selenium Grid provider. Selenium provides a list of capabilities. In the screenshot, the capabilities JSON conforms to the requirements for Sauce Labs. If you are unfamiliar with JSON, use the Ranorex Studio ⇢ capabilities configurator. Simply select your capabilities and provider and let the configurator put together the JSON. Then, just paste the JSON into the Capabilities JSON box of the endpoint. Click Save to confirm. The configuration appears in the endpoint details.